This little doe and her family wander past my window outside of Albany on most days, and seeing them reminds me of one legislator’s attempt to solve a couple of problems: Too many deer in some cities, and deer killed in traffic being left on the roads. Problems with deer have been reported in Joseph, John Day, Ashland, and even parts of Portland. The animals mess up gardens, may spread disease, and sometimes gore pets and even terrorize people. 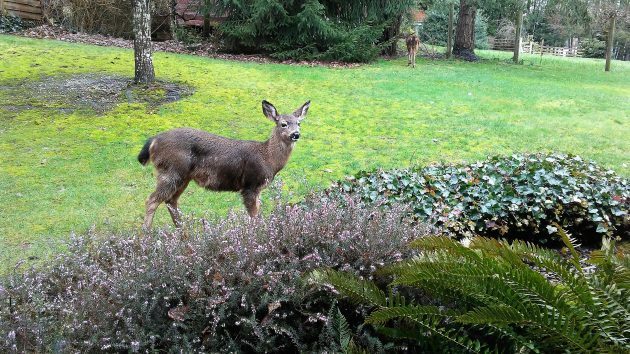 The Albany paper recently carried a letter from Corvallis woman complaining about deer destroying her plants. Senate Bill 373-A would authorize the state wildlife department to kill deer in cities that ask for deer control. The House Agriculture and Natural Resources Committee held a hearing on the bill on April 25. Members who expressed themselves, including Rep. Sherrie Sprenger, R-Scio, seemed to agree that deer can be a problem. But so far the committee has not acted. The bill would authorize cities to pass an ordinance declaring they have a deer problem and to ask the Oregon Department of Fish and Wildlife for help. The department then could send in wildlife agents to take out deer to bring their number down. But first a city making the request would also have to ban the feeding of deer and possibly other wildlife. Animals killed in such a campaign would be processed and the meat given to the Oregon Food Bank. Because of that, they could not be killed with poison darts. They would have to be shot. Sprenger wondered how this would work since cities usually ban the discharge of firearms. But Sen. Bill Hansell, R-Athena, the sponsor of the bill, said wildlife agents have the authority to shoot in cities. The Oregon State Police testified they are worried that the roadkill bill would open a loophole that poachers could exploit. If they’re stopped by a trooper with a deer or elk in the bed of their pickup, they could say they were on their way to get a salvage permit after hitting it. But that problem seems to have been solved in the 20 or so other states including Washington that already have roadkill-salvage laws. The Senate passed both of Hansell’s bills, but as of Sunday the measures have not moved beyond the committee hearing in the House. If we leave this up to the legislature they will probably initiate a program to import cougars into cities to control the deer population. Pets, No! ..but terrorize the peeps?! The House committee heard about one woman who was scared to go outside because her yard was full of deer — bucks, I think. I know of someone in Ashland who was set upon by an aggressive deer on the street. Tony, they’re already here. No need to import but you might want to keep your kitty cat inside. Sorry, Hasso, but the deer do not know where the city limits are. We had a forked horn in our backyard not 10 feet from the house on the 5th of May and we live inside the city. I have seen deer feeding on the lawn at the Linn County Court house at 2 and 3 am. Admittedly, they reduce the amount of pruning and deadheading of my roses, phlox tulips, etc.